I know the media is full of stories telling us housing is so unaffordable that first home buyers are being priced out of the market, but that’s not what the latest HIA – Commonwealth Housing Affordability Index suggest. The Housing Industry Association figures show affordability continued to improve in the September 2013 quarter with improvements driven by further interest rate reductions. 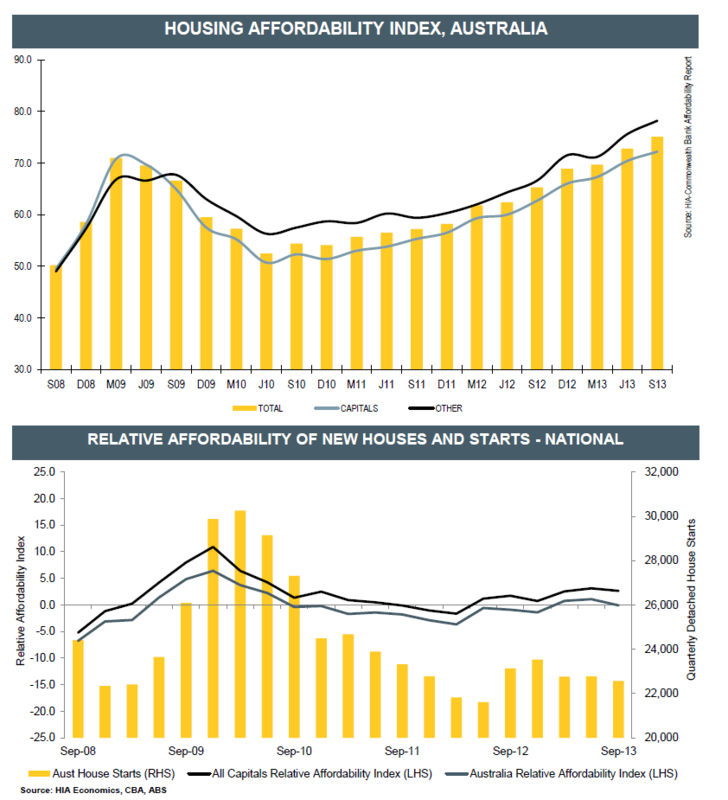 The HIA-Commonwealth Bank Housing Affordability Index increased by 3.2 per cent in the September 2013 quarter to a level of 75.1.increased by 3.2 per cent in the September 2013 quarter to a level of 75.1. The aggregate capital city affordability index increased by 2.6 per cent over the September 2013 quarter to reach 72.2, a level that is 15.2 per cent higher than in the September 2012 quarter. The increases were stronger across regional Australia, with the affordability index rising by 3.4 per cent over the quarter to reach 78.2. This level is 17.4 per cent higher than in the same quarter in 2012. Despite widely-publicised dwelling price increases in some markets in recent months, affordability has continued to improve as a result of reduced interest rates. Since late 2011, the RBA has cut rates by a total of 225 basis points, including reductions in both May and August of this year. As a result, the discounted variable interest rate for mortgages has declined from 7.05 per cent to 5.18 per cent over the same period. In the September 2013 quarter, the HIA-CBA Housing Affordability Index improved in every one of the seven capital cities covered. Outside of the capital cities, affordability improved in the September 2013 quarter in four out of six non-metro regions reported. The strongest quarterly improvement was for regional Victoria with a rise of 5.1 per cent, followed by the non-metro areas of Queensland (4.4 per cent), New South Wales (2.8 per cent) and Western Australia (2.5 per cent). Affordability declined by 1.2 per cent in regional Tasmania and by 2.2 per cent in regional South Australia. The Affordability Report’s recent addition of an index tracking new house prices relative to established house prices provides an indication of the affordability advantage to be found among new houses. In the September 2013 quarter, a new house affordability advantage was apparent in a number of markets. However, only in Sydney and Western Australia does this latest result represent a continuation of a trend of new housing affordability advantage that has been in place for a number of quarters. “This new house affordability advantage provides a signal for further growth in new construction activity in those markets,” commented Shane Garrett. “High taxation on new housing has adverse effects on affordability right across the market. The less than expedient release of shovel-ready land supply for new housing and inefficiencies in the planning process also need to be tackled. It is also important that infrastructure funding models are reviewed by policy makers so as to ensure that the affordability improvements of recent years prevail over the long term,” concluded Shane Garrett. Lolza. Talk about lies, lies and damned statistics. Im confused, are they talking about housing affordability or selling investment opportunity. Banks so funny.